The 2018 NCAA season is in full swing with two full (and a few Week 0 games) weeks in the books. Preseason lists are items of past and hold little weight on the season to date as one of the more talked about awards in all of sports — the Heisman Memorial Trophy — saw no shortage of ‘Heisman Hopefuls’ before the season started. With two weeks of data at our hands, the Heisman race is taking shape although we’re many, many weeks from officially crowning the most outstanding player in college football. Often given to the country’s best offensive player on the nation’s top offense, we at PFF grade every player on every play and have a wealth of data to accurately depict those players who influence the game more than any other, regardless of offense or defense. After two weeks of football, our early favorites to be in the Heisman race all season are a varietal cast of who’s who across the country. There’s a lot of football to be played, yet these players have shown their penance to maintain top-level play through two weeks of the season and if they keep it up, will certainly be in the conversation all year. 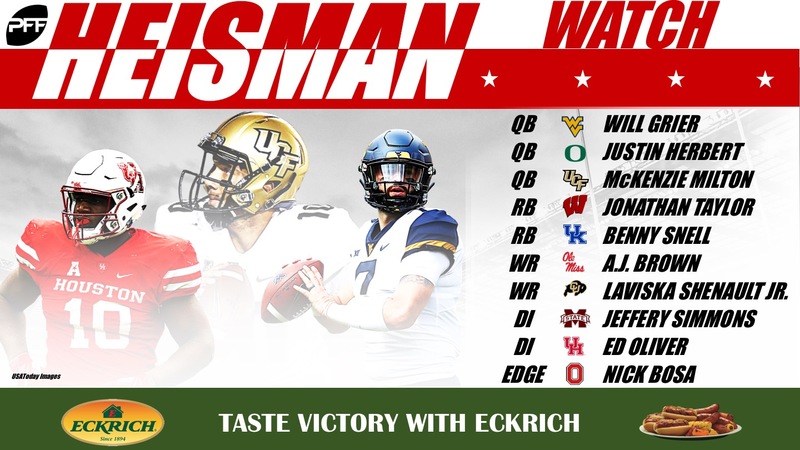 This Heisman Watch list is brought to you by Eckrich, the Official Smoked Sausage of the College Football Playoff. The nation’s highest-graded quarterback through two weeks (94.0), Grier has completed 46-of-60 attempts for 761 yards and a 9:1 touchdown to interception ratio on the basic box score data, but jumping into his advanced PFF numbers, you see how dominant he truly has been. Most notably, when kept clean from pressure, Grier has lit up defenses to the tune of a 95.8 passing grade and a ridiculously perfect passer rating (158.3). He’s picked right back up where he left off last season. Herbert may not get nearly as much notoriety as he deserves, playing out on the West Coast. That’s not at all his fault, rather, his play should make viewers take note. Herbert currently holds our fifth-highest passing grade in the nation and has shown an incredible feel for his deep passes this season. Despite multiple drops on deep balls (20-plus yards), he has completed 5-of-11 passes for 164 yards, four touchdowns and an elite passing grade on deep passes. Milton may have stumbled while proverbially ‘looking over’ their Week 2 opponent in South Carolina State but that shouldn’t hurt him too much in the long run if he can revert back to his Week 1 self. Against UConn in their season opener, Milton finished with an 89.2 overall grade as he showed remarkable poise inside and outside of the pocket en route to a 90.1 passing grade. If he puts this SC State game behind him, he’ll maintain his firm spot atop this list. Running behind the nation’s top offensive line sure has its benefits as Taylor has surely gained yardage easier at times than other running backs in the country. However, when isolated outside of his blocking, Taylor’s elusive rating of 119.5 ranks fifth among the nation’s backs with at 30 touches. Taylor has forced 13 missed tackles on 51 carries and averaged a whopping 4.69 yards after contact per attempt. A relative unknown from those outside of Kentucky and us here at PFF, Snell has had a personal vendetta since Day 1 at Kentucky when he was overlooked as a high school recruit. He’s made teams pay by forcing 44 missed tackles each of his first two seasons with the Wildcats and if his two-game sample for this season is any indicator, he’s well on his way to surpassing those marks in 2018. He’s forced 11 missed tackles on 48 carries and is currently averaging 4.82 yards after contact per carry and was huge in Kentucky’s upset victory against Florida. The nation’s top slot receiver, Brown has been dominant through two games with Jordan Ta’amu firmly planted as the team’s starting quarterback. Through two games, Brown has hauled in 15-of-16 catchable targets for 251 yards, three scores and a ridiculous 158.3 passer rating on targeted throws. He’s feasted on deep throws this season, catching all three passes targeted 20 or more yards downfield, all for touchdowns and 118 yards. Pegged by PFF Analyst Jordan Plocher as his offseason player to watch for 2018, Shenault has shown up big time in Colorado’s first two games. His 88.3 receiving grade is fifth best in the country and third-best among Power-5 receivers as he has averaged 13.7 yards after the catch per reception. With two highlight-reel catches, including the game-winning score against Nebraska this past week, Shenault has vaulted into the national spotlight for good reason. Overlooked by most in the preseason because of the man we’ll talk about next, Simmons has put forth two extremely strong outings in 2018, supplanting everyone as the nation’s top-graded defensive interior lineman. Simmons has recorded six total pressures as an inside rusher while all seven of his solo tackles have been defensive stops for an offensive failure, showing just how much havoc he can cause by himself. Oliver, the nation’s top run-stopping defensive player over the past two seasons is up to his usual tricks so far in 2018. On 61 snaps in run defense, Oliver has recorded seven stops without missing a single tackle attempt for an 11.3 percent run-stop percentage. What was lacking in his previous seasons, however, was a pass-rushing skillset necessary to be considered a top pick and a Heisman hopeful. Through two games, he’s recorded eight total pressures and a 77.3 pass-rushing grade, much higher than his previous two season’s worth of pass-rushing grades (69.3, 69.2). Not much needs to be said about Bosa, who has played only 72 total snaps through two games as he’s been relegated to the bench due to the blowout nature of both of Ohio State’s victories. Bosa has been the charge on the defensive side of the ball as he’s currently the nation’s top-graded edge defender at 91.6 overall. Leading the nation’s best defensive line is one thing, winning a ridiculous 34.8 percent of your pass-rush reps is a completely different animal. Bosa is a beast and deserves any and all praise he receives.